Chocolate Chip Brownie in a mug just saved me. Chocolate always has magical powers — not to make problems go away, but to make them seem less daunting. Besides it tastes really, really good! Being fresh from the oven — well microwave — and eaten while still warm helps too. Oh Oh Oh Misery! I had a post ready yesterday about a wonderful dessert – sooo good it gives me goose bumps thinking about it. I was about to hit the publish button and got called to help with some project or other and when I came back an hour later, the computer was not glowing its usual glow. Hmmm, I thought, I don’t remember taking time to shut things down. And that would be weird anyway since the computer is the first thing on in the morning and the last thing off at night. Then with my mind on the dessert, I started pressing keys. Nothing. N O T H I N G. Not a thing!!! No reassuring glow on the monitor. No gentle whir of the fan. Nothing. Dead silence. And darkness. I bolted for the stairs. Bytes!! The computer is dead! He came on a run. A dead computer is a full out emergency. I watched as he twitched and tweaked first one thing , then another. Oh no. Nothing. Not a thing. N O T H I N G happened. I fled to the kitchen, unable to bear the thought of no computer. A few minutes later, Bytes came into the kitchen lugging the monitor/computer and a handful of cords, in search of an electrical outlet that was more accessible than the one buried under the desk and over two feet. In short order, he made the diagnosis. The capacitor was gone. Kaput. Nothing. To make a long story short. . . a new capacitor has been ordered and expedited. Since, of course, there is nothing local that would work. But tomorrow – given the wonders of the big mail order store in the sky and the green and purple van – tomorrow, the new capacitor arrives. In the meantime, chocolate. This chocolaty “don’t have to share with anyone, just for me to soothe my nerves and give me strength” was just the ticket. You can enjoy it anytime. Don’t wait for a computer emergency. Edited to add: When the taste testers got the opportunity to try these for lunch one day, they requested a more fudgy brownie. I added a fudgy option to the recipe directions. Take your pick! Chocolate when nothing else will do! Add butter and brown sugar to a 12 ounce or larger mug. Heat in microwave on high 30 seconds. Remove from microwave. If butter is not melted, heat another 10 seconds. Stir with a fork. Mix in egg and vanilla. Stir in cocoa powder. Add flour, baking powder and salt. Stir until well mixed. For a cake type brownie: Microwave for one minute 30 seconds on high. Top will rise and look dry on top. Do not overcook. 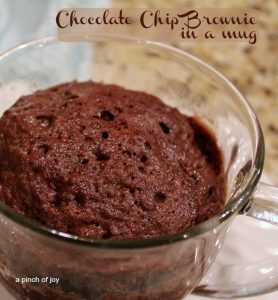 For a fudgy brownie: Microwave for 2 minutes on 50 percent power. Top will still look somewhat moist. Do not overcook. Add ice cream before serving, if desired. Fabulous Fudge - 5 minutes, 3 ingredients to make THE Best gift fudge ever!